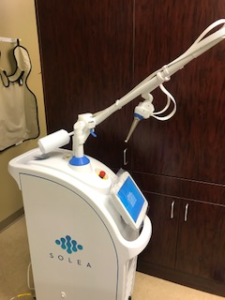 Patient comfort is very important to us at Cromwell Dental Care, and we are excited to introduce our newest way to reach this goal—The Solea Dental Laser! No shots, no pain, and easy appointments! How are we incorporating laser dentistry at Cromwell Dental Care? Laser dentistry provides a way for Dr. Cromwell and Dr. Conley to complete select restorative treatment and soft tissue procedures with no anesthesia! We are using a CO2 laser as a cutting instrument to remove decay or existing filling material from teeth, then filling it back in with the same resin-based composite material used previously. It can also be used to shape gum tissue and heal canker sores! How will it benefit our patients? No one wants to come to the dentist for a filling. It takes time out of your day, and you can’t feel your mouth when you leave. Fun, right? Not anymore! The efficiency and precision of the laser, and no need for anesthesia, shorten your appointment time and allow you to leave ready to return to all your normal activities for the day. This also helps ease dental anxiety, as everyone agrees getting a shot in the mouth is not the most comfortable feeling in the world. Read more about our pain-free advancement here.